Kristen Stewart was spotted arriving at LAX Airport to catch a flight to Paris on Tuesday. The 26-year-old actress wore head-to-toe black as she sashayed through the terminal in what looked like an attempt to go incognito. She donned a Local Authority sweatshirt underneath a Saint Laurent bomber jacket, which had zipped and snap-buttoned pockets. To keep the look casual, she teamed the look with ripped jeans and a pair of black sneakers. Kristen hid her eyes behind a pair of sunglasses, and accessorized the look further with a silver chain-and-padlock necklace. To complete the laid-back look, she went bare-faced and rocked a slicked back hairstyle. Kristen slipped into a pair of the classic Adidas “Superstar 2” shoes. 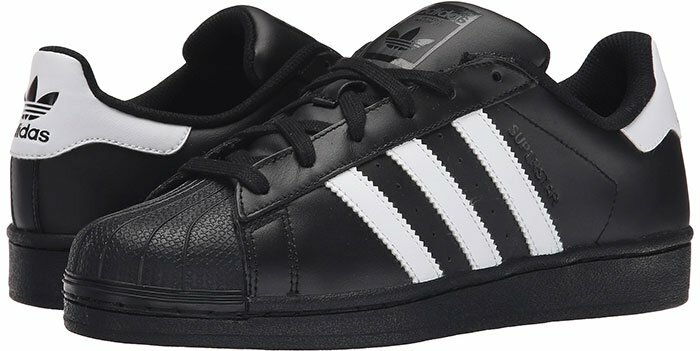 These black leather sneakers feature contrasting 3-stripes design, rubber toe caps, lace-up fastenings and rubber soles. Check them out at Zappos.